Purists on both sides of the rugby divide will argue the merits of union or league, but there are a select few who have made a name across codes. With Shontayne Hape and Chris Ashton included in Martin Johnson's latest England squad after cutting their teeth in league, we take a look back at the players who made a mark in both codes in our latest Scrum Seven. One of the greatest centres produced by Wales, Scott Gibbs was brought into the limelight in union and perfected in league. By the time he joined St. Helens in 1994 he had already won Test caps for the British & Irish Lions, but it was on his return to union following the switch to professionalism that his real impact was seen. He represented Wales at the 1995 Rugby League World Cup and lifted the Challenge Cup with Saints before bringing league's physicality to union and was an instant revelation. Three further Lions caps followed, as well as a 'Player of the Series' award, in the victorious 1997 tour to South Africa. A dual code and dual nationality international, Brad Thorn has enjoyed success in both codes. Born in New Zealand, Thorn emigrated to Australia with his family while young. His rugby education began with the Brisbane Broncos in the NRL and he made his debut for Australia in 1997, having already played for Queensland in the State of Origin series. In 2001 Thorn crossed codes and returned to New Zealand, where in the colours of the Crusaders and Canterbury he forced himself into contention for All Black honours. Wavering over his commitment to union, Thorn would not make his Test debut until 2003, when he played 12 Tests including the Rugby World Cup. He crossed codes again in 2005 to rejoin the Broncos, but returned to union in 2007 with Tasman, winning a Super 14 title with the Crusaders and rekindling his international career. A pioneer in union and league, Bill Hardcastle set the template for crossing codes in the earliest rumblings of the international game. His All Black debut came in 1897 on tour to Australia, where he would eventually settle. He won his only Test caps in 1899 and 1903 - but in the colours of Australia. His first Test came against the touring British Isles and his second came as a wing forward against the All Blacks. In the early years of league Hardcastle was also present, turning out for the Ipswich club near Brisbane and winning international recognition for Australia, again against New Zealand, in 1908. Few players have made such a memorable impact after crossing codes. Robinson had been a legend with Wigan, England and Great Britain before switching to the 15-man code with Sale in 2000. He was fast-tracked into the England ranks and made his international bow against Italy in the 2001 Six Nations. There was more to come as Robinson was selected for the Lions' tour to Australia later that year, scoring tries in the first and third Tests. His crowning moment in union came in 2003, when he slid across the whitewash at Stadium Australia for England's only try in their Rugby World Cup Final victory over the Wallabies. He retired in 2007 following his second World Cup Final, and England are yet to get close to replacing one of the most dangerous runners ever seen in a white shirt. In one of the more acrimonious splits, Sonny Bill Williams' defection to union with Toulon in 2008 brought with it a wave of anger from NRL fans and officials. Williams jumped ship from the Canterbury Bulldogs to try his hand in the Top 14, with a £300,000 transfer fee eventually settling a long-running saga. His union career stuttered into life but he eventually rediscovered the running game that had turned so many heads in league. He made his first foray into international rugby in the colours of the Barbarians, losing heavily to Australia in 2009, and has been tipped as a future All Black. The Wallabies have seen a mixed bag in terms of recruiting NRL talent, with the success stories almost always balanced out by a failure. Lote Tuqiri notched 67 Test caps for Australia and became known as one of the most dangerous wingers in the game at a time when Mat Rogers, a brilliant runner who is missed by union, and Wendell Sailor were making their first strides. 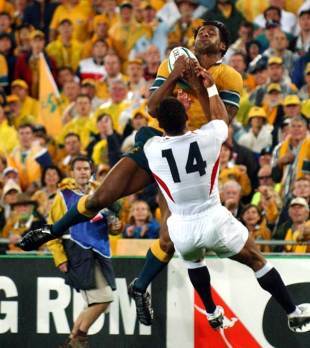 Tuqiri's classic balance of pace and power made him a good fit for Australia, and he was also on the scoresheet in the 2003 World Cup Final. Disciplinary problems blighted parts of his career and in 2009 his contract with the Australian Rugby Union was terminated, leading to a spell in England with Leicester Tigers. In league, he had excelled with the Brisbane Broncos, in tandem with Sailor, and won recognition with Queensland in their victorious 2001 State of Origin series and eventually with Australia the same season. Parsons' story is one that shows the friction that existed between the professional ranks of league and the amateur union, with his league achievements almost in spite of, rather than because of, his beginning in union. A legendary figure with St.Helens, with whom he won the league and Challenge Cup as well as recognition with Great Britain and Wales, Parsons' union career was cut short after one Test for Wales, against England in 1947, aged 19. After being selected for Wales' trip to face France in Paris as a replacement for Ossie Williams, rumours that he was planning to turn professional were exacerbated by his resignation from the Monmouthshire Police force. When the train passed through Newport to collect Parsons, he was told by the secretary of the Welsh Rugby Union, Captain Walter Rees, that he would not be making the trip. He continued to press his claims, notably as part of the combined Abertillery/Cross-Keys pack that took on the Wallabies, but finally 'went north' in 1948.